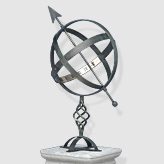 Equatorial sundial based on historical model. The gnomon points toward the celestial pole (polar star) and can be adjusted for geographic latitude. Permanently weather-proof. 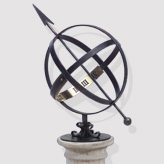 The cast brass equatorial sundial Jupiter is manufactured using the manual sand mold method. The brass is resistant to corrosion even under the influence of seawater and takes on a natural patina over the years. The artifical patina gives the historic sundial even more authenticity. We also offer a matching pillar made of artificial concrete as an accessory. The delivery of the pillar is included in the price for deliveries within Germany. Please ask for details on deliveries abraod if required.